Circa 1896. 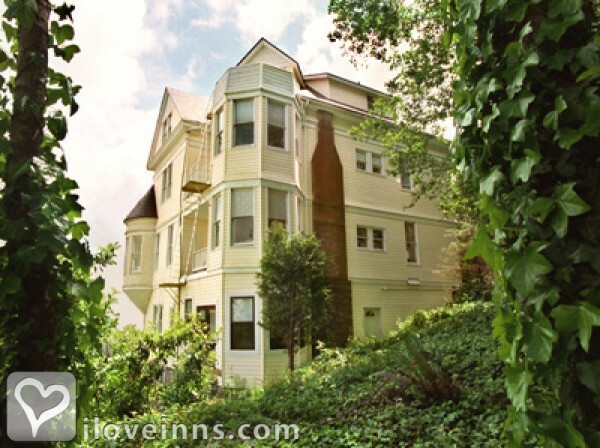 To fully enjoy its views of the Columbia River, this Victorian house has both a tower and a turret. 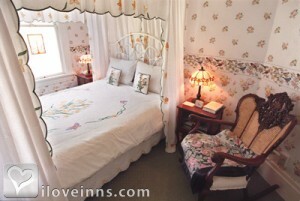 Antiques and white wicker furnishings contribute to the inn's casual, homey feeling. The Bird Meadow Room is particularly appealing to bird-lovers with its birdcage, bird books and bird wallpaper. Breakfast, served in the main-floor turret, frequently includes smoked salmon with bagels and cream cheese.Publicity and Awards: Pacific Northwest Magazine, Northwest Discoveries, Los Angeles Times, Oregonian, Daily Astorian.Location: City/Urban. Queen spindle mahagony bed. Serengeti wallpaper. Leopard, cheetah, lynx wallpaper in private bathroom with old-fashioned clawfoot tub. View of 1920s era Masonic Temple, 100-year-old church, and our North garden. This room has a cozy queen canopy bed and a view of our North and West gardens and 100-year-old Victorian style Episcopal church. Tucked away on our lowest level for privacy. Wake up to sunbeams streaming through bay windows in the sunny south side room. Lilac and Iris motif. With view of the Astoria Column, treetops and nearby Victorian homes. Has a queen bed and a day bed, with private bath. This is our most popular room. A spacious room with beautiful view of the Columbia River through tower windows surrounding a private reading nook. Excellent overview of the Columbia River and mountains across the river. Look down to see our North garden and yard. Also see the nearby Grace Episcopal Church and our local Performing Arts Center--both Victorian-style buildings. Wonderful Song bird wall-paper sets the theme for this bird-brained room. Enjoy books about birds, or listen to their melodic calls. Queen Canopy bed with private or shared bath. Smallest, coziest room with pink petal paper, pictures and comforter. View of Victorian homes, treetops and the Astoria Column. Queen bed with shared bath. One of our largest rooms, with breathtaking view of the Columbia River and our west grove from fourth floor Tower Balcony. Queen wrap bed with private or shared bath. Delightful view of Washington State mountains, the Columbia River and the rolling clouds dictated the soft blue and white motif. With a luxuriant Queen bed, daybed and private bath. This peaceful room abounds with sweetpeas and butterflies. Mini view of ships to the North and Victorian homes to the south from your east windows. Queen canopy bed surrounded by lace and private bath. Payment types accepted include Visa, Master Card and Discover. Rooms: This property has 10 total guest accommodations, 7 with private bath, 3 with fireplaces, 2 suites. The types of beds available include Queen. Meals Included in Rates: Breakfast and Snacks/Refreshments. 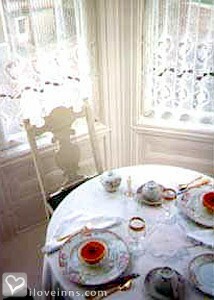 Types of meals: Full Breakfast and Snacks/Refreshments. Amenities On Site: Parlor Games, Phone and Fireplace. Events Hosted: Weddings, Romantic Getaways, Family Reunions and Meetings. Other Activities: Antiquing, Fishing, Live Theater, Parks, Shopping (Local Crafts), Water Sports, historic homes tour, old-fashioned trolley, river walk, aqua center, movie complex and forts. Flavel House (8 blocks), Heritage Museum (1 block), Firefighters Museum (18 blocks).